Due to his Twitter and Reddit participation, Evan Mathis has become something of a unifying force for fan goodwill on the Internet. Honestly, I’m not sure there’s anything Eagles fans online agree about more than that Mathis must be retained. At the risk of setting off a mini-revolt from those legions of supporters, I wonder if the enthusiasm has gotten a bit out of control. Is Mathis really as valuable as everyone says? There’s at least circumstantial evidence that points in the opposite direction. First, we should remember that only a year ago, Mathis was completely unknown. With the Panthers and Bengals from 2007 to 2010, he started only seven games. He wasn’t a highly-valued free agent, just a veteran journeyman, and the Eagles signed him at the end of August last season largely because of Danny Watkins’s surprising holdout. If a bunch of options at right tackle, like Ryan Harris and Winston Justice, hadn’t failed so miserably, Mathis might not even have been promoted to the starting lineup. Now, none of that on its own is damning. Players rise and fall over the course of their careers. Mathis is a good fit for Howard Mudd’s system, and his rapid offseason body change may have contributed to his revitalized prospects. Still, we must wonder whether a career year at age 30 is really indicative of future top performance. The other question, for which I don’t have any conclusive answer, remains: was Mathis as good last year as many people thought? I’m not trying to take anything away from what was clearly a solid season. Mathis provided stability to an offensive line that desperately needed it and had good results despite sharing the middle with two rookies. But at the same time, former NFL linemen have said that left guard is one of the easier line positions. Mathis manned that side with Jason Peters, a truly dominant force, and yet runs to the left tackle netted the third-worst mark in the league, according to Football Outsiders. When Todd Herremans lined up in that spot, directional rushing to the left was alwasy a major strength. In 2011 it became a mixed bag. Furthermore, Mathis just never passed the eye test that a supposedly top-five-type guard might. He gave up few negative plays, but I also never found myself saying “wow” after one of his highlights. 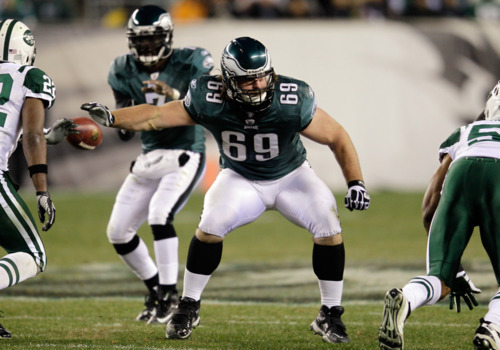 With Todd Herremans and Shawn Andrews in recent years, the Eagles have had guys on the interior that could lay claim to the “dominant” descriptor. As solid as Mathis was, to my eyes he was never that. All of this is not to say the team absolutely shouldn’t resign Mathis. I’m actually in favor of that move in theory. But if he has other offers for significant money, would the Eagles really be wise to get into a bidding war for his services? I think not. Tagged with Philadelphia Eagles, NFL, Evan Mathis, Offensive Line, Guard, Jason Peters, Danny Watkins, Jason Kelce, Todd Herremans, Football Outsiders, Shawn Andrews, Running Game, Age, Free Agency. February 23, 2012 by Brian Solomon.